Antibodies are critical tools in protein and molecular detection systems. 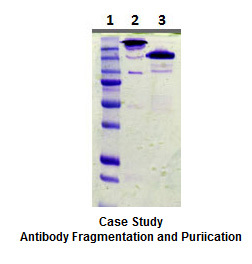 Although intact antibodies (IgG or IgM) are ideal for most immunoassay applications, the performances of certain procedures can be enhanced by using antibody fragments such as Fab, F(ab')2, or IgG (half antibody). Contact us to obtain your quote. Obtain a Fragmentation Information Sheet and please mail completed form with your sample. Papain is a nonspecific, thiol-endopeptidase that has a sulfhydryl group in the active site, which must be in the reduced form for activity. Papain has been shown to produce heterogeneous fragments from IgM. Oligosaccharides in the hinge region of IgM interfere with papain digestion, causing a cleavage shift of 3-5 amino acids in either direction. Pepsin is a nonspecific endopeptidase that is active only at an acid pH and it is irreversibly denatured at neutral or alkaline pH. It is possible to produce F(ab')2, Fab and Fv fragments using pepsin to digest IgM. Trypsin is a serine protease that reacts optimally at pH 8.0. In general, increasing the enzyme/substrate ratio and/or temperature will increase the rate of digestion. Trypsin can generate F(ab')2, Fab, "IgG" - type and Fc5µ fragments from IgM. Trypsin digestion of several species of IgM was studied using trypsin with and without urea pretreatment. 26 Urea alters the susceptibility of the domains to digestion and produces different fragments than those digested in aqueous buffer. Many other procedures have been developed to digest IgM using trypsin. Mild reduction can be achieved using 2-mercaptoethylamine (2-MEA), Hydrochloride (HCl). Reduction will vary among IgM species, but an "IgG" - type and/or reduced IgG ("rIgG") should be formed in varied proportions, depending upon reduction time and/or temperature fragmentation of mouse IgM also produces an inverted "IgG"-type fragment.